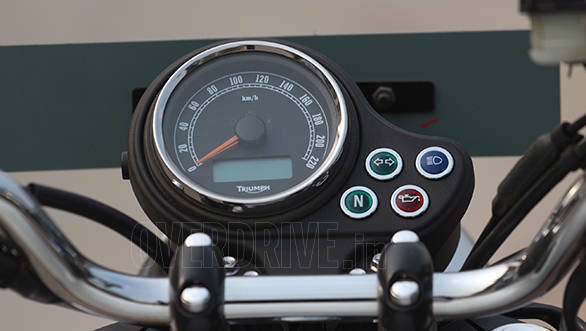 There are few motorcycles with a bigger backstory than the Triumph Bonneville. You've probably read the story a zillion times. The one that begins with the twin-carb Thunderbird-based motorcycle that broke the land speed record. Which became the name of the subsequent 1959 motorcycle that happened to be Edward Turner's last Triumph design. The motorcycle was the toast of the town through the 60s and while was around the 70s, it was already past its heyday. But it had left a big impression - of speed, of reliability and its name was immortal. So when John Bloor resurrected Triumph, that the Bonnie would be resurrected was almost given. However, Bloor didn't return to the Bonneville until he'd done much of the work on which Triumph stands today. And when the motorcycle came out in 2000, it was a lot of things the old Bonnie was and a lot of things, the old Bonnie wasn't. The old Bonnie was a speedster, a performance motorcycle. The new one was a delicious retro but its power figures were easily eclipsed by many, many motorcycles, including other Triumphs at the time. 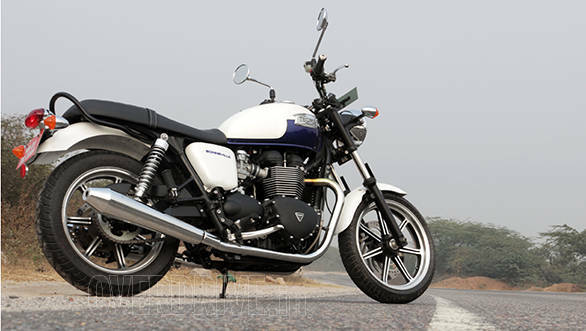 However, they got the motorcycle as right as can be and the Bonnie has been an enduring product in the Triumph line and has evolved into a number of motorcycles, from the still more retro T100 to the Thruxton cafe racer and the Bonneville America cruiser. 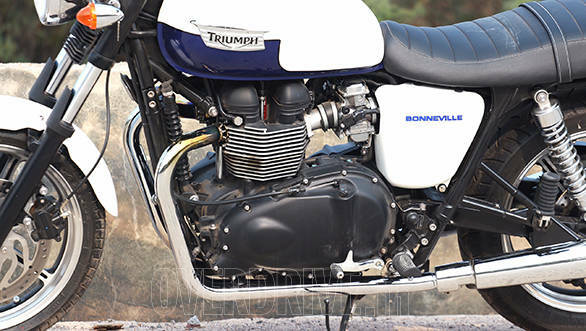 What we have today, though, is the simplest of the lot, the Bonneville. No suffixes, no prefixes, no messing around. Just a simple motorcycle that is supposed to remind of the good, old times and keep it simple. Yeah, that doesn't sound exciting at all. And the international reviews do not help one little tiny-teeny bit. They all say, roughly, likeable, 68PS (at 7500rpm) motorcycle. They say nothing about it is exceptional and neither is anything objectionable. They couldn't be more wrong. India tends to change perspectives and the Bonnie, here, is a tremendous little motorcycle. All three words have great significance in this story. First, the motorcycle. The Bonneville is a simple motorcycle. The original (Bloor Bonnie) engine was an air-cooled 790cc parallel twin that's grown in time to the current 865cc setup. It is mated to a five-speed gearbox. In the transition, it's lost the original carburettors and gained fuel injection, but the external cases of the throttle bodies have been made to look like fake carburettors. It's an odd detail that sticks out as dishonest to me, but it does go with the rest of the bike visually. The engine makes 68PS, which is in the same ballpark as the Kawasaki Ninja 650. The engine itself, wears more retro cases and the story goes that the engine was always designed to remind you of the original Bonneville and that's why the engine cases are shaped as they are. Triumph designed the engine to look right first and then engineered it to run right, as it were. Holding the motorcycle together is a double cradle frame with straight forward suspension.17-inch alloy wheels round out the motorcycle. The result is pretty, evocative and not very light. At 225kg (wet), the Bonnie isn't an exceptionally light motorcycle and with a wheelbase of 1490mm, it isn't a short motorcycle either. Second, little. The trick the Bonneville pulls off rather sweetly is that it doesn't feel quite as long or large once you are in the saddle. The seat - look carefully - is actually pinched towards the front and this makes the seat height an eminently acceptable 740mm. That means even the short-seamers among us lot will get their feet on the ground heels and all without trouble. This makes the motorcycle very easy to climb on to and ride around with. So low is the seat that the first time you put your feet on the rubber pegs, you might actually think the pegs are mounted too high, in fact. Finally, tremendous. I loved riding the Bonneville. Over a full day of low speed trundling, high speed thundering and everything in between on the outskirts of Delhi, I discovered that the Bonneville fits India almost as if it was designed to. For instance, the engine makes 68Nm at 5800rpm, but more importantly, the torque is instantly available almost off idle. Rolling on the throttle produces instant, heady acceleration unless you've let the revs drop alarmingly low. But, 68Nm isn't a heck of a lot of power. So you're not going to get scared of the power. A 200PS motorcycle can be intimidating. But 70PS most people will learn to work with. The Bonnie is in that sweet spot where it is fast enough to thrill but gentle enough for you to like it, appreciate it and not be afraid of it. On the stock pipes, it doesn't sound anything other than a sweet twin though I understand that aftermarket pipes produce quite the exhaust note. I also like the fact that while you're playing, nothing interrupts the flow. 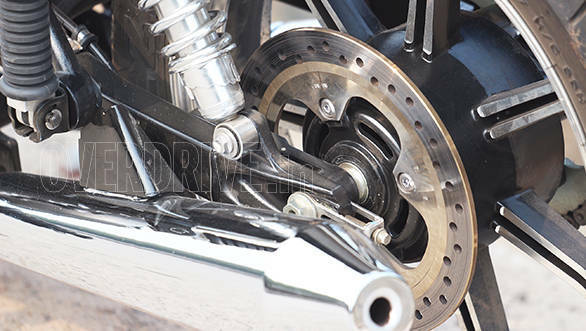 The gearbox is smooth and the brakes - sans ABS on the test bike - are extremely sharp, very strong and very rich in feel. The engine makes 68Nm at 5800rpm, but more importantly, the torque is instantly available almost off idle. Similarly, the handling is also interesting. I found it a little bit surprising but the feel reminded me strongly of the Harley-Davidson SuperLow. The Bonnie feels long and low and it turns into corners at a moderate pace but it feels absolutely great. The long wheelbase and the weight both exaggerate the send of both speed and lean and makes cornering the Bonneville thrilling in feel. It is, however, a stable motorcycle by design, so despite the sensory drama, you're usually leaned over less than you think and going slower than you feel. Again, this in my book is a good thing for new riders getting on their first properly large motorcycles. What doesn't fit India quite as nicely is perhaps the ride quality. The suspension isn't really underequipped but it isn't clearly tuned for our roads so the the ride could stand to be a bit more supple, a bit more absorbent. The Bonnie's not rock hard and won't have you off the seat or anything, but it feels damped just a tad too much for our roads. But what makes the Bonnie truly great is how much fun it is to ride. 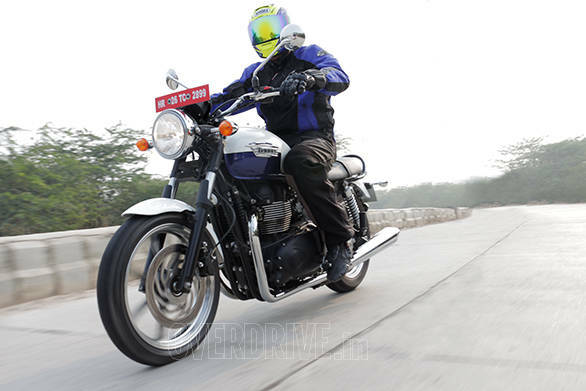 Buzzing through light traffic, screaming down the open stretches, leaning into corners tight or sweeping, the Bonneville seems to be dancing in step with you. Having perhaps, just a little bit more fun than you, even. It's this feeling of joy that ties up the whole experience and elevates the Bonneville experience to something rather special. In fact, I'm going to have to do a comparison to cement this hunch, but if you were to pick between the SuperLow, the Ninja 650 and the Bonneville - all roughly Rs 6.1 lakh on-road - I think the Bonneville might not be the fastest but it will certainly be the coolest of the lot to ride. More interesting to me is the realisation that if this is what the entry-level Triumph feels like to ride, what will the rest of the range be like! Forget the backstory of the Bonneville and look at it as the prologue to the Triumph range and we (should) have in our hands a phenomenal range of motorcycles to ride and own.